When the creative team behind Opal 28 dreamed of their future event space, they didn’t necessarily intend on it being a wedding venue in Portland, Kristi Thomson, General Manager, explained. 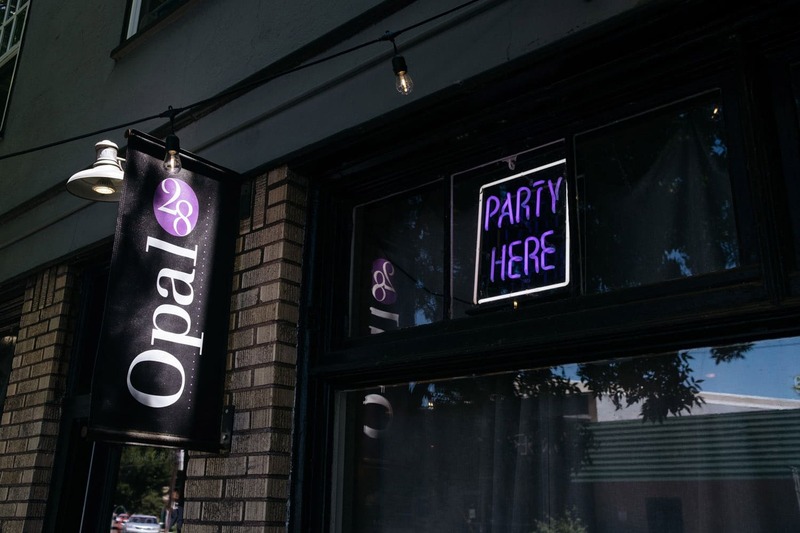 But Opal 28 had already been transformed in many unexpected ways before it was voted Oregon Bride Magazine’s “Best Intimate Venue” in 2018. Originally built as a house in 1908, the space that is now the “Main Room” of Opal 28 served a grocery store in the 60’s, with 4 one-bedroom apartments atop that now provide fully furnished vacation rentals for the bridal party or guests traveling from afar. The space is niche for couples seeking a more intimate setting for their big day. In fact, they don’t even get many “traditional” weddings. 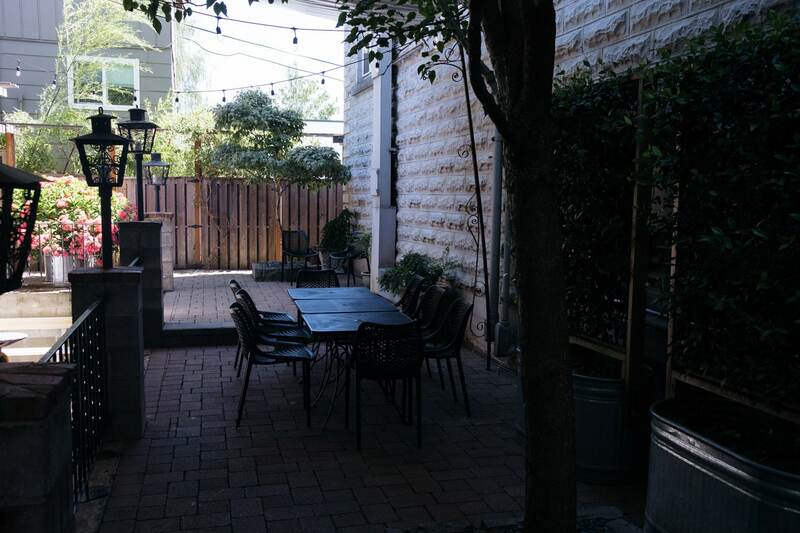 The 2,600 square foot space includes a private patio, two “great rooms”, built in OLCC bar, a commercial kitchen with in-house catering available, accommodations for up to 16 guests, and a parking lot that can fit 16 cars. The outside patio, nestled in back with brick stone ground with trees above with a white canopy covering the area. It is also decorated with twinkle lighting and lush greenery, is the perfect spot for an outside ceremony. Opal 28 can accommodate 70 guests for a seated ceremony on the patio, or 100 guests for a standing ceremony & cocktail style reception. The cozy backyard feel makes for a super cushy setting for couples and their cherished guests. Inside Opal 28 are two “Great Rooms” filled with character. It has exposed brick walls, and large wall-length windows providing a plethora of gorgeous natural light. This area can accommodate 55 guests for a seated ceremony and dinner in the Main Room. 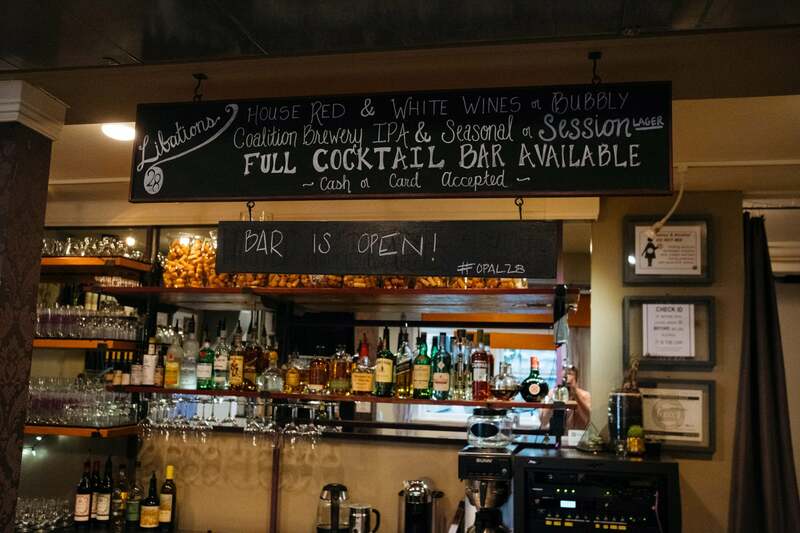 It may be technically be a venue, but the space is so inviting and warm that you feel the comforts of being at home. Add to that the luxury of a staffed full bar, catering, and no clean up! The group of “party starters” at Opal 28 understand that every event there is unique. Providing staffing to assist with day of logistics and set up ensure that things flow smoothly. Thus, you don’t have to worry about anything but having a great time! Included in the Venue fee are plenty of table and seating options, various serving ware, glassware, décor and centerpiece options, and audio and visual tools. The versatile space can host anything from elegant wedding ceremonies to birthday parties or bridal showers, to formal dinners or corporate meetings. This locally Portland owned & operated team seems to have wedding events figured out to a T like a well-oiled machine! I would definitely have my wedding event here!